"Sure. We should check out that Field of Blood you've been eyeing on the way." "The what?" "The field. The normal field where you haven't killed yourself." 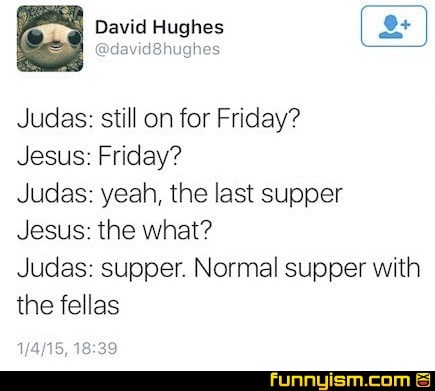 Remember, if your "boy" wants to hang out on Fridays, he's probably a Judas. The last supper was Holy Thursday. What an amazing stolen joke posted on Twitter and now here.